Has recorded 23 unlimited wins Currently ranks as the second highest winning hull of all time. One short of being tied for #1. 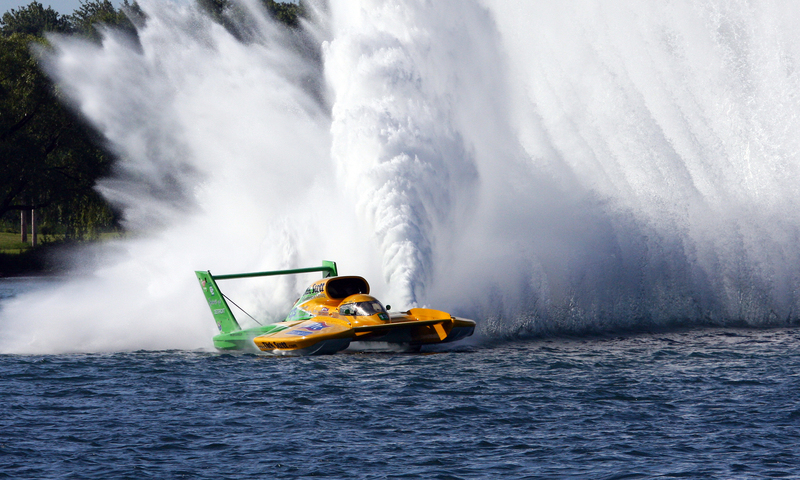 Was the first unlimited hydroplane to officially exceed 170 MHP lap average on a 2.5 mile course. This record was set on June 3, 1993 while qualifying on the Detroit River. It is a Detroit lap record that still stands. 1988 Circus Circus, 1991 Winston Eagle, 1994 Smokin’ Joe’s, 2005 Al Deeby Dodge. The only boat to ever win the coveted Gold Cup in 3 different decades. In 2006 under direction of Curt Tavenner, the U-13 hull was totally rebuilt by the Detroit Unlimited Racing crew incorporating the latest safety and technological features. Lycoming T55-L7-C turbine rated at 2750 HP. Propeller turns 10,000 rpm and measures up to 16″ in diameter. Approaches speeds up to 200 mph.